Designed with parenthood in mind. 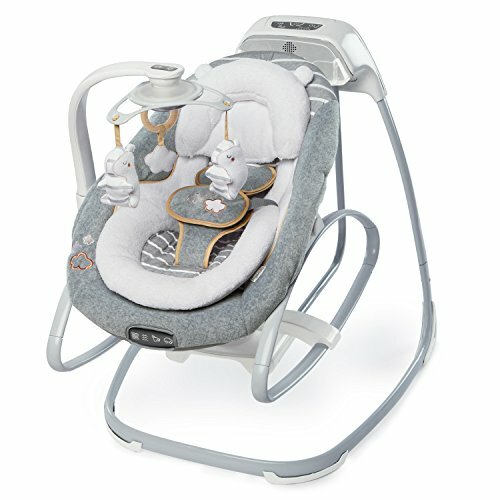 Ingenuity's Smart Size Gliding Swing & Rocker is a premium, modern design with technology that upgrades baby's soothing experience to the next level. With 2-in-1 functionality of converting from a swing to a rocker, parents can easily decide on a swing for baby. From Ingenuity's newest collection, the Boutique collection, this 2-in-1 swing is designed with premium, luxurious fabrics that are as comfy-cozy as they are practical. Remarkably soft fabrics pamper baby in luxurious softness with an added bolster and character head rest that offer extra support for smaller babies and can be removed as baby grows. Even the safety harness is wrapped in soft, fleecy fabrics to protect baby's sensitive skin. The tasteful Boutique fashion is sure to compliment the decor of any home. Perfect for a girl or boy. When things get a little messy, the contoured headrest and seat pad can be removed and tossed in the washing machine. This fully-loaded compact swing takes up 30% less space than full-sized swings. Easy for mom to move around the house with a lightweight frame and wheels. To convert into a rocker, simply lift the rocker seat from the swing base and place on the floor. Customize baby's soothing experience with 4 different vibration modes of a standard vibe, wave, car ride, or calming heartbeat. The mobile is adorned with 3 dreamy toys. While in swing mode, engage baby with 8 melodies, 3 nature sounds & white noise. The Connect Me feature allows you to connect your smartphone or device to customize baby's entertainment. Lull baby with ease in an oversized seat with adjustable recline, that swings in 4 different directions and rotates 360 degrees. Get a few hands-free moments with a swing timer that can be set to 30, 45, or 60 minutes. Save money on batteries with the AC adaptor.